Brittany Saucier, Branch and Business Development Manager for the Merrimack’s Business Center Office in Concord. 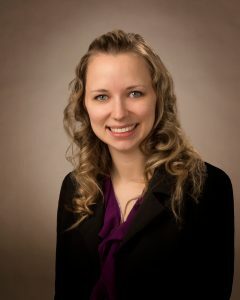 Brittany Saucier has been promoted to Branch and Business Development Manager of the Merrimack County Savings Bank (the Merrimack) Business Center office in Concord located at 190 North Main Street. She replaces Rosemary Richardson, who retired in September. Angelo Haralabatos, Branch Services Manager, now oversees the Merrimack’s Hooksett Welcome Center location, previously managed by Saucier. Saucier joined the Merrimack in 2011 as a Teller at the Bank’s Bow office. She was later promoted to Customer Service Representative in 2012 and promoted again to Branch Services Supervisor in 2014, when she began overseeing the Merrimack’s Hooksett Welcome Center. In 2015, Saucier was promoted to Branch Services Manager. She resides in Concord, NH with her family.